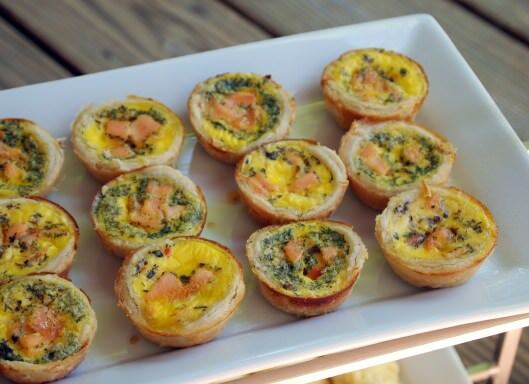 Smoked salmon quiche bites are the perfect appetizer or brunch treat. 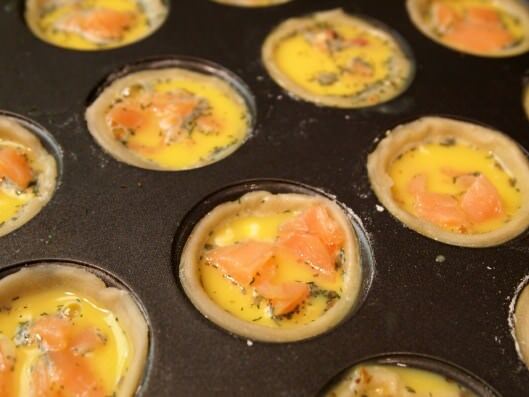 Two bites of smoked salmon, nestled in flaky pastry along with with herbed eggs, goat cheese, and dill. 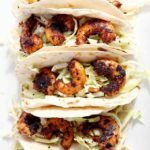 This recipe is sponsored by Land O’ Lakes and all thoughts are my own. Friends, I love brunch. Brunch is my favorite meal because it combines all the greatness of breakfast with just a dash of lunch, and as an added bonus, it is not served early in the morning. One of best parts of a big brunch spread is the quiche. Quiche is my favorite. 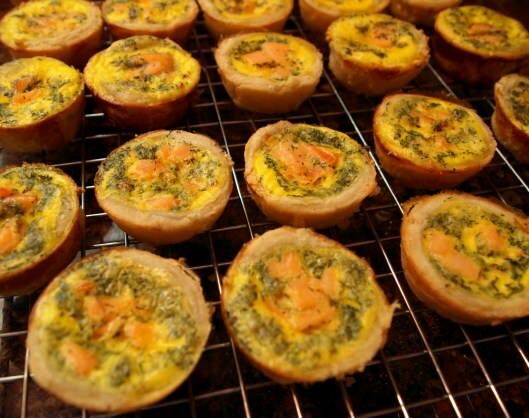 The only thing better than a quiche…is a mini quiche! 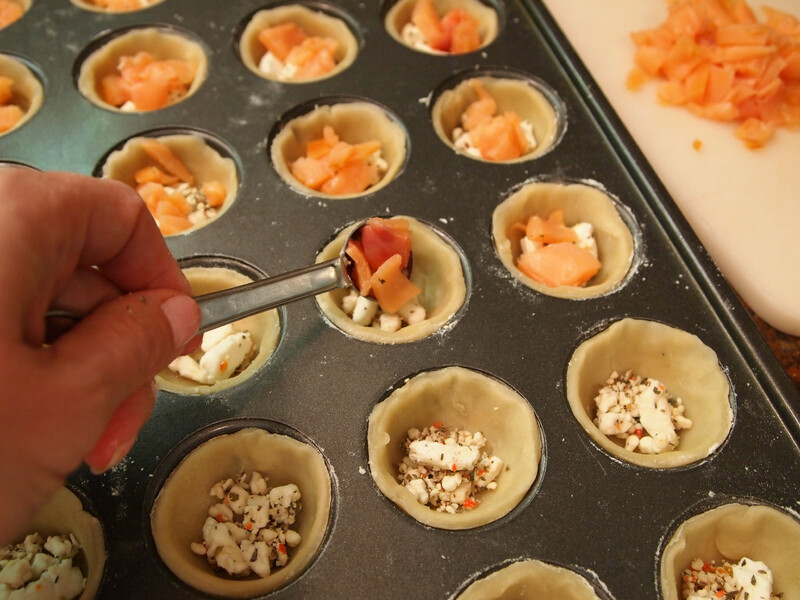 But when that mini quiche is chock full of smoked salmon and herbed goat cheese? Well, something about that flavor combination reels me in every single time. Get it? Reels. Salmon. Fish joke. Heh, heh. 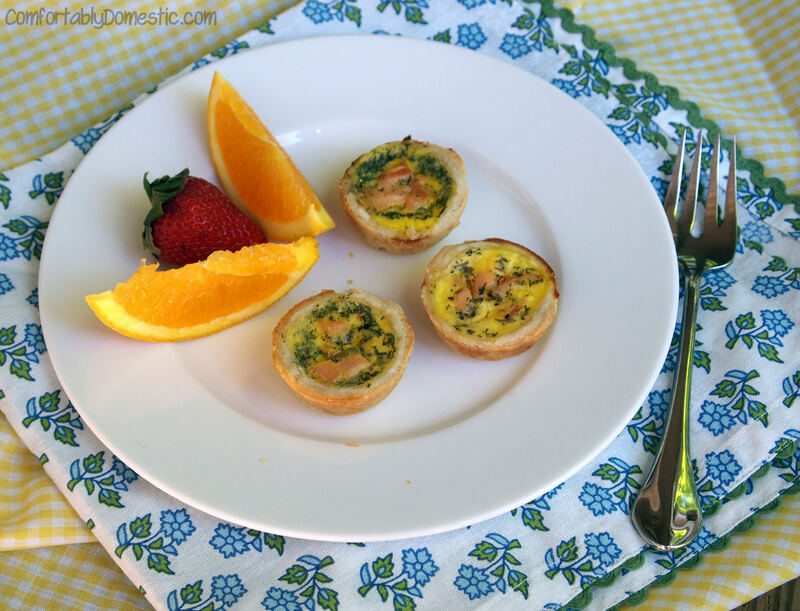 Smoked salmon mini quiche bites blend the luxury of smoked salmon with the creamy tang of goat cheese to make a wonderful addition to any brunch menu. The bite-sized quiche are fun to eat, and incorporate instant portion control! That way there is plenty of room on the plate for a variety foods. Besides, brunch isn’t brunch without a healthy representation of eggs. Not only do I have a fab new recipe to share, but I am very excited to be partnering with Land O’ Lakes Eggs in featuring Bite-Sized Brunch ideas. Now y’all know that Land O’ Lakes Butter holds a special place in my heart. They know butter, but did you know that Land O’ Lakes offers Eggs? I had no idea! But I was glad to hear about it, because they made my Smoked Salmon Quiche Bites the star of my brunch. 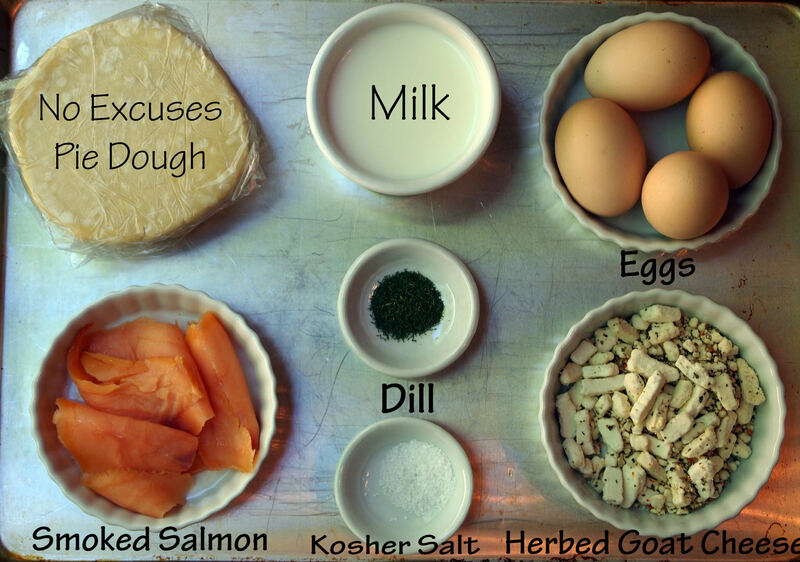 1 recipe for No Excuses Pie Dough, milk, eggs, herbed goat cheese crumbles, kosher salt, dried dill, and thinly sliced smoked salmon. Dice the smoked salmon, and set it aside. Pour the milk into a large (4 cup capacity) liquid measuring cup before adding the eggs. Toss in the kosher salt and dried dill. 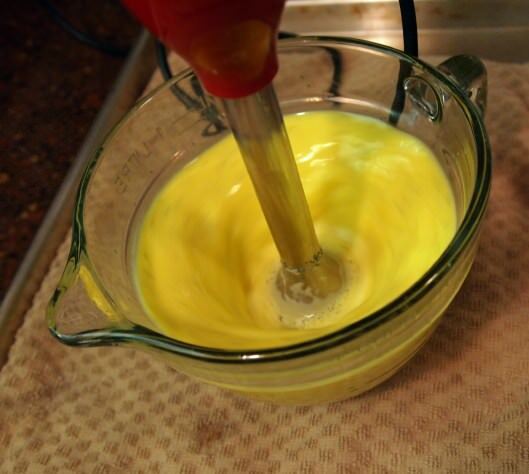 Whisk until the eggs are well combined. Or, if you’re in a hurry like me, bust out the immersion blender and run it on speed 1 for 5 seconds and be done with it. Some days require expediency. 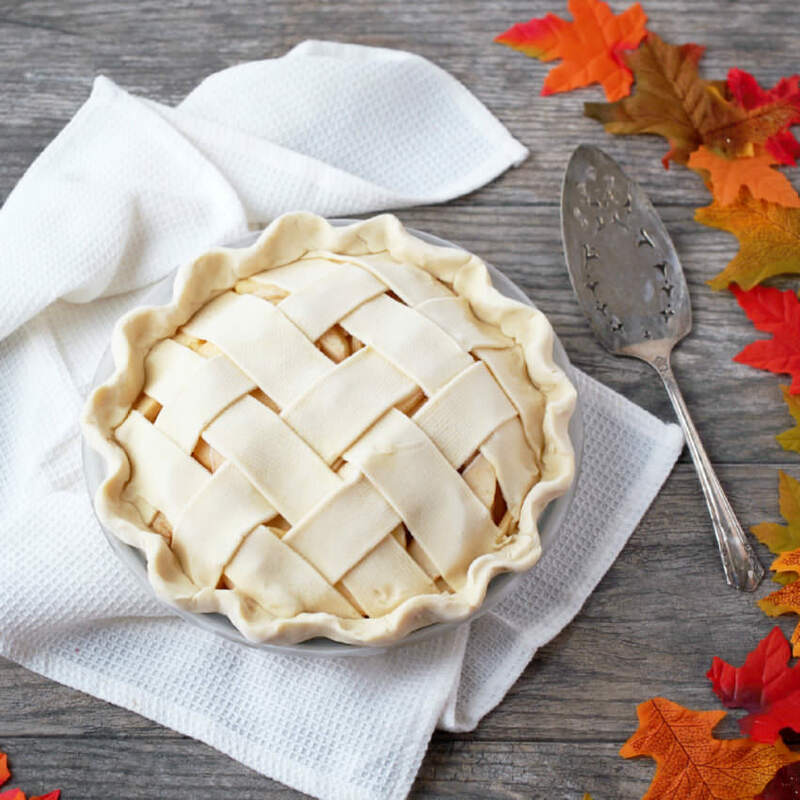 Roll the pie dough out on a well-floured surface to 1/4-inch thickness. 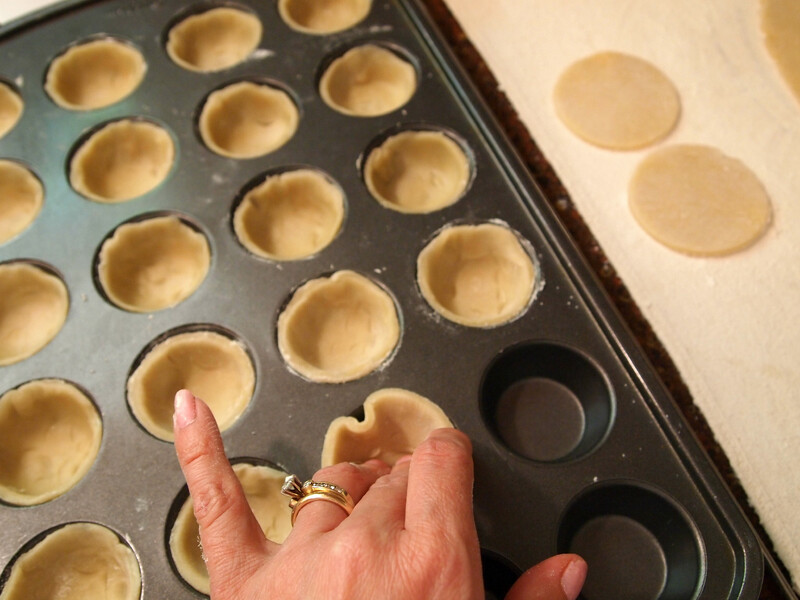 Use a 2-inch round biscuit cutter to cut 24 circles of pastry. Piece together and re-roll the dough, as necessary. Place each of the pastry circles into the well of a mini muffin pan. I find it helps to elevate a pinky while situating the pastry. I hear that’s how the Pastry Chefs do it. Okay, I totally just made up the pinky thing. 😉 Just make sure the dough makes full contact with the the bottom and sides of each well or it will shrink while baking. Place a half-teaspoon of herbed goat cheese into each pastry. 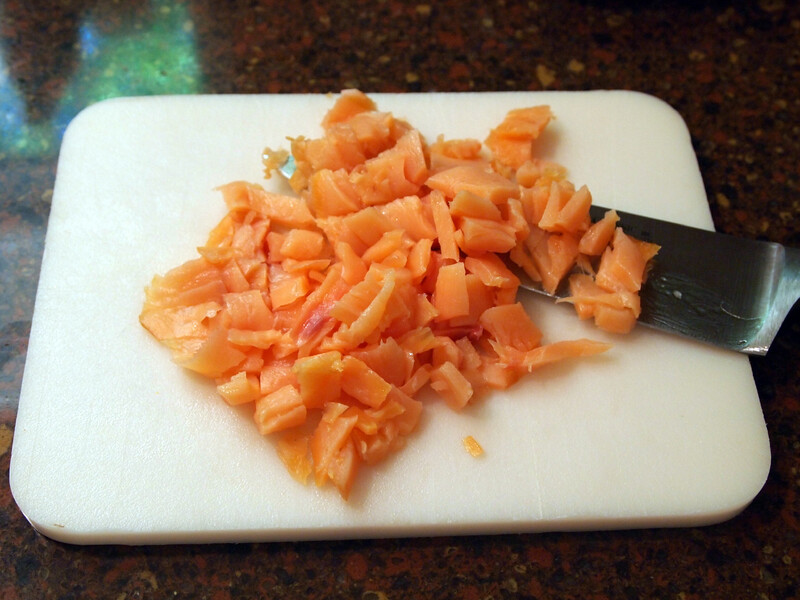 Then add a little of the chopped smoked salmon. Give the egg mixture a quick stir to redistribute the seasonings. 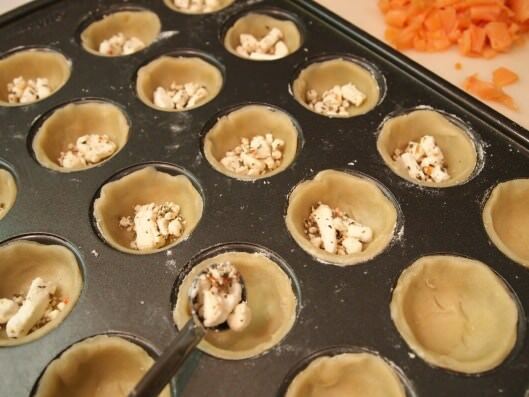 Pour the egg mixture into the pastry cups until they are 3/4 of the way full. Bake at 375° F for 15 minutes, or until centers are set and the pastry edges begin to brown. 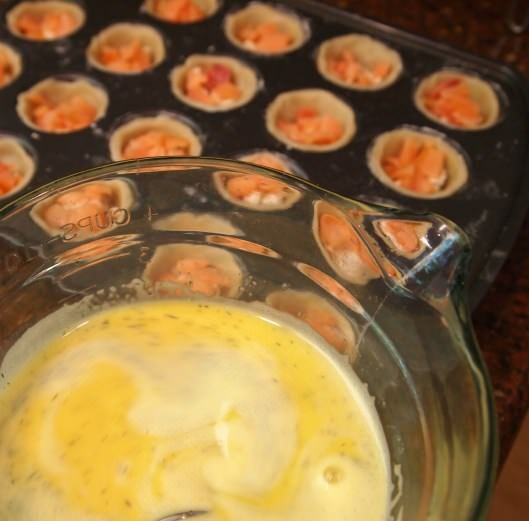 Let the smoked salmon quiche bites cool for 10 minutes in the pan before running a thin knife around the edges to loosen the pastries. Pop the quiche out of the pan and transfer to a wire rack. Serve warm or allow to cool and serve at room temperature. Smoked Salmon Quiche Bites will be the Bite-Sized Bright Spot of your next Brunch spread. Smoked salmon is nestled in flaky pastry along with with herbed eggs, goat cheese, and dill for a glorious bite-sized treat. 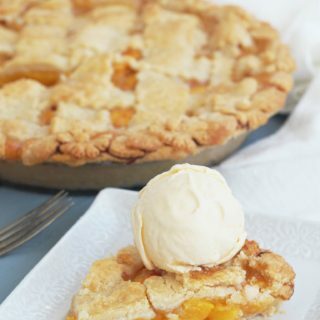 Roll out pie dough on a floured surface to ¼-inch thickness. 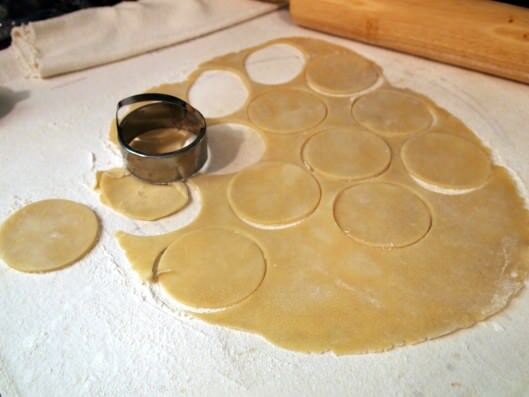 Use a 2-inch round biscuit cutter to cut 24 circles out of the dough, re-rolling as necessary. Line the cavities of a mini muffin pan with the pastry circles, ensuring that they fully reach the bottoms of the cups, and form a mini-pie shell in the forms; set aside. Chop the salmon to a 1/4-inch dice. Place ½ tsp. of goat cheese crumbles, and ½ tsp. chopped smoked salmon into the bottom of each pastry lined cup. 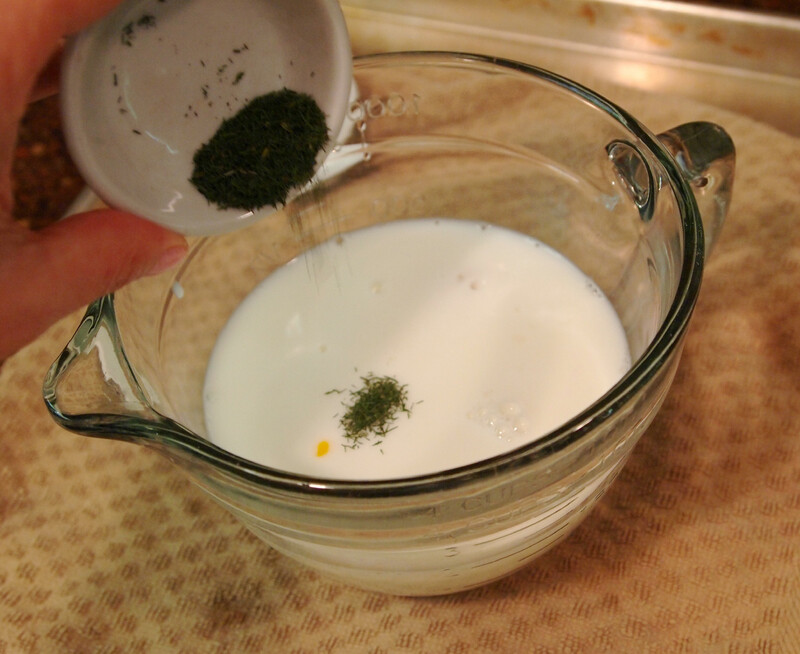 Whisk eggs, milk, salt, and dill until well blended. (I like to use an immersion blender for this task.) 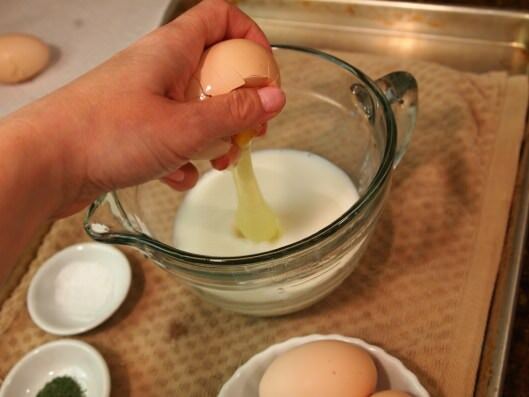 Stir the whisked egg mixture, and pour enough of it in each cup to fill it ¾ of the way full. Bake for 15 minutes or until centers are set but not cracked or dry. Let quiche bites rest in the pan set on a wire rack for 10 minutes. After 10 minutes, gently run a thin knife around the perimeter of each quiche to loosen and pop out of the pan. 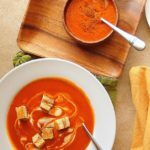 Serve warm, or cool completely and serve at room temperature. Notes: Depending on the size of your mini muffin cavities, you may have extra egg leftover. No worries! It makes excellent scrambled eggs for a snack. 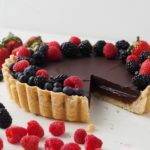 Recipes easily converts to a full sized 9-inch quiche—place all ingredients in an unbaked 9-inch pie shell, and extend baking time to 30-45 minutes. Also, to make ahead: cooled quiche bites can be frozen in a single layer on a baking sheet, then transferred to a freezer bag. Freeze for up to two weeks. To serve, thaw overnight in the refrigerator, and serve quiche at room temperature. 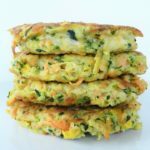 I have a great giveaway to share with you courtesy of Land O’ Lakes Eggs that will help make your next brunch a huge success. Hooray! A Two-Tiered Server with Plates (from Crate&Barrel) for a beautiful yet sturdy way to display your brunchables. An On-Ice Deviled Egg Server (from Crate&Barrel), which ices down the eggs to keep them safely chilled for a good long time! A Mini-Muffin Tin (also from Crate&Barrel) that can be used to action any number of treats. And a coupon redeemable for the full value of a dozen Land O’ Lakes Eggs. Free eggs, Friends! Just leave me a comment telling me about your favorite brunch food. Or you can just say “I like bacon.” and we’ll call it good. Of course, I’d love it if you wanted to hang out with me on facebook, Twitter, or Pinterest. 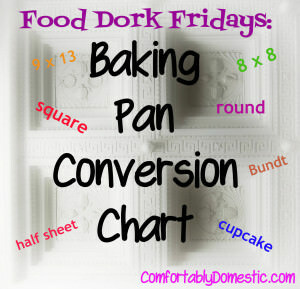 It should also be known that I do a little Happy Dance every time a new Friend subscribes to Comfortably Domestic. True story. If you tweet or follow any of the ways listed above, be sure to leave another comment here to earn extra entries for the giveaway. Due to the enormous size of the prize box, this giveaway is open to my Friends in the Continental US. Giveaway will run through Monday May 28, 2012 at 8:00 p.m. EST. One winner will be chosen at random. I will email the winner, and they will have 48 hours to respond or another winner will be chosen. 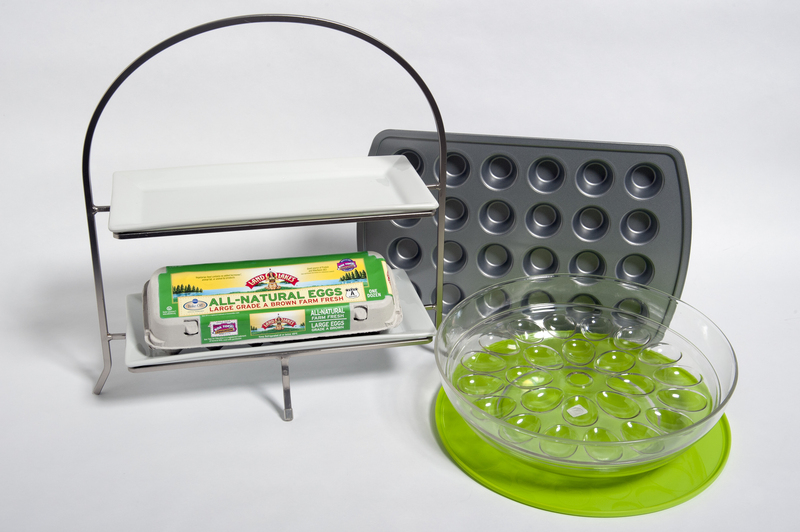 Not-So-Fineprint: I received a premium gift package from MoArk, including an On-Ice Deviled Eggs Server, Mini Muffin Tin, Two-Tier Server with Plates and a full-value coupon redeemable for any variety of LAND O LAKES® Eggs to giveaway to one of my readers. I was not compensated for this post. All opinions are my own. Thank you LAND O LAKES® Eggs for your generosity! LAND O LAKES® Eggs shares all sorts of cool info on Twitter and facebook. Quiche also appears to be quite a staple within our weekly evening meal selections. 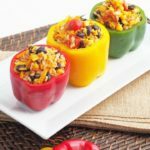 They have been simple, economical and can take on any taste you desire with all the elements you'll add. 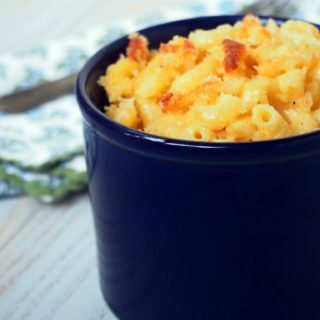 Thanks for sharing this amazing recipe with us. You are so welcome! Quiche is wonderful for all of the reasons you mentioned. I made these the night before last for a shower. Please note, the circles should be 3" not 2"; the smaller size will not even go half way up the sides of the little wells in the 24 mini muffin pan. Luckily there was enough pie dough to re-roll and use a 3" cutter. Also, the tiny quiches barely take a spoon full of egg mixture, so I would reduce that by half. I did make a second quiche in a loaf pan with all the leftover dough, etc. They disappeared at the shower. Wow! It sounds as if we have different sized mini muffing pans. I give you huge props for persevering through the recipe to make it work for you. Well done, Nancy! Although we do not make brunch in Greece, I love it! 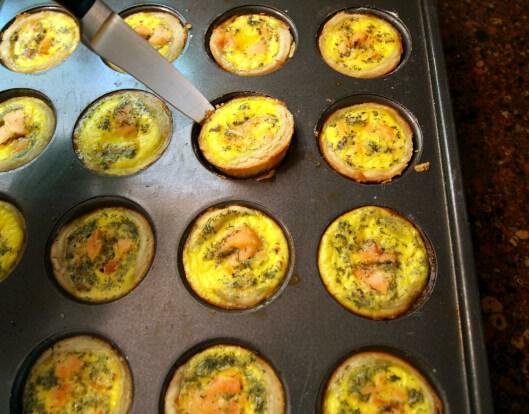 And these quiches look absolutely mouthwatering! For brunch, I love making an overnight egg bake with ham, onion, lots of cheese and saltine crackers. My favorite brunch food...Epicurious's Creme Brulee French Toast with a side of bacon. And I do buy/use Land O Lakes eggs. Well I commented on your facebook page, but I'll comment here too. Just for fun! 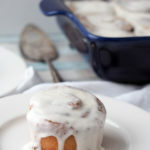 :) We LOVE brunch recipes and will be making these for sure. Very unique. P.S. My family LOVED your merlot mushrooms too. Delish! I don't qualify for the giveaway, but thought I'd let you know I love brunch too. I don't often make Eggs Benedict, but if I'm eating brunch out, that's my meal of choice! Bite-sized brunch implies a level of moderation that I do not have. That aside, I am a major fan of huevos rancheros, chilaquiles, migas, breakfast tacos and this borderline-obscene omelet you can get in the next town over that is smothered in chili. SHAMELESS. Love the WannaBeTexan lilt to your brunch favorites. ;) Huevos rancheros are darn near perfect, but an omlet smothered in chili?! That sounds divine. My favorite brunch food is bacon grilled cheese. It's the epitome of breakfast and lunch and you can dress it up or down any way you want. I am now stalking you on all of your social sites, but don't worry, I'm totally cool. Quiche is my favorite breakfast food. I like bacon. Except, that's a lie. I love bacon. Seriously though, these look delicious. I'd love to win! I have 4 boys to feed too. My favorite brunch food is muffins, because you can make them almost as sweet as cupcakes, but for breakfast! Although buttermilk pancakes are choice, also! Of course I follow you on Twitter & Pinterest. Because I'm a chatty stalker like that.